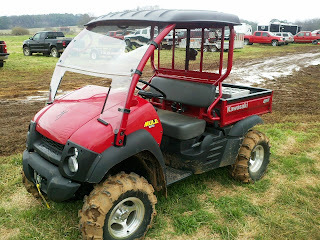 I resisted for a long time getting an UTV, or whatever they call these things. I have friends that take these things out west with them and hunt off of them. They have the bigger models with two bench seats, enclosed with heaters, dog boxes and everything is first class! I'm not to that point, yet, but I did want one to run around the farm, road dogs, etc. I got a lot of support from the ball and chain on this, too, which surprised me. She loves the Mule. I highly recommend the roof and windscreen, too. Now, some add-ons I need to get: gun-rack, dog boxes for back, cooler holder for cold beverages.....what else?